Ce document au format PDF 1.3 a été généré par CorelDRAW Versión 12.0 / Corel PDF Engine Version 1.0.0.458, et a été envoyé sur fichier-pdf.fr le 27/04/2010 à 12:42, depuis l'adresse IP 90.8.x.x. La présente page de téléchargement du fichier a été vue 3514 fois. Taille du document: 1.4 Mo (3 pages). 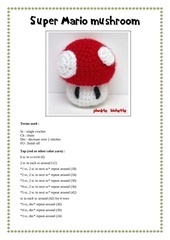 A free crochet pattern by Irka! The Chip &amp; Dale charachters are property of Disney Studios and were created by the Walt Disney Company. I used the characters without permission. 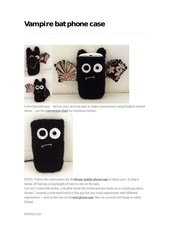 This pattern is not on sale and I do not created it to gain any money; just for the fun of it.. 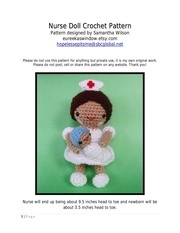 So, if you crochet this dolls, please do not sell them. white, black and red yarn. time to stuff in the head. 14- st2tog in each sc around (6sc). Fasten off all 6sc tog. 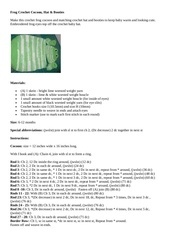 2- Crochet 2sc in the first st, 1sc in the next 2st, 1ch and turn the work. stitch). See pictures to adjust position. next 3st and 2sc in the first st.
5sc and 2sc in the last sc. 4 and 5- 1sc in each sc around. face. (See pictures). Stuff and stitch. 4- 1sc in each sc around. 1slst, fasten off. 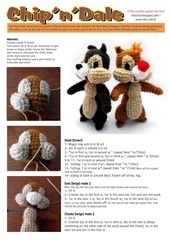 Stuff and stitch it between the cheeks. 1- Ch 10. Turn. Make 1slst in each st. Fasten Off. 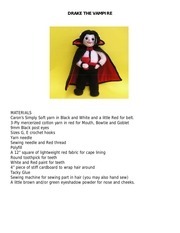 Before stitching this part, you have to embroider the mouth with black and red yarn. Then, fix the &quot;lip&quot; to the bottom and sides of the mouth. See pictures. 1- Magic Ring with 6st. 2-1sc in each all around, fasten off. (like the fleeces on a scarf) to make it look like that. See picture. 2- 1 sc in each, turn. Stith each ears to teh top of the head. Yep, this is all just one chipmunk. Fix the body to the head. each next 6 st and 2sc in the first st.
next 2sc, 1sc in next 10 sc, and 2sc in each next 2sc (29). 1- Magic Ring with 4 st.
ch and turn the work. 6- st2tog, 1sc in next sc, st2tog and turn. 7- st2tog and fasten off. the last sc and 1 slst in the first sc of this round. of the black line. (See pictures). Ce fichier a été mis en ligne par un utilisateur du site. Identifiant unique du document: 00020196.